Although credit bidding – in which the secured creditor can credit bid the amount of its allowed claim in any sale of its collateral by its debtor – is acknowledged as being an important part of the secured creditor’s bundle of rights, some argue that in certain circumstances credit bidding can chill bidding or otherwise prevent the debtor from maximizing the value of its assets. Credit Bidding in Bankruptcy Sales details how the courts have handled this debate, with reference to specific cases such as Fisker and Free Lance-Star, and also provides practitioners with the information they need to know when reviewing credit agreements, debtor-in-possession financing orders, and sale orders related to credit bidding. When, and to what extent, is credit bidding allowed? How might a credit bid be submitted in a bankruptcy sale? 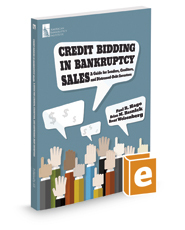 The book also includes an in-depth analysis of how credit bidding affects professional fees.